Kirsten Kirchner Paralegal at Harrison & Mecklenburg, Inc.
Kirsten graduated from Oklahoma State University with a Bachelors in Animal Science with a Production option. She has also complete and Paralegal Certification course through Oklahoma State University. Kirsten was raised in Sherman, Texas and after high school graduation she went to OSU where she met her husband, Mark. They were married after graduation from OSU and moved to Clovis, NM where Mark worked for Cargill and Kirsten work at a vet clinic. After ten months in Clovis they moved to Kingfisher, OK where Mark began working for CHS and Kirsten for BancFirst. 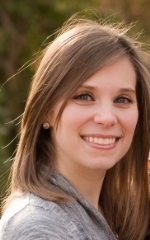 Kirsten started working at Harrison & Mecklenburg, Inc. in February of 2013. She specializes in lease cancellation cases and title exams but is branching out into other areas of legal work. Kirsten and Mark have a son named Ethan and three dogs. They enjoy watching all OSU sporting events and spending time outdoors exploring and cooking.